Michael Dayton Hermann in his Tribeca studio with some of the paintings in his upcoming solo show Flowers. Photo by James J Williams III. There's a rare breed of people who are good at almost everything they do. They are creative and business-minded at the same time; they can write books, play instruments, paint, draw, and raise happy kids. Michael Dayton Hermann is one of those people. In a world and society that for the past 20 years has focused on hyper-specialization and super niche silos in every possible industry, Michael defies that narrow-mindedness with conviction and elegance. Besides being a hands-on father to five-year-old twin boys and a devoted husband to a very busy gallerist, Michael holds the position of Director of Licensing at the Andy Warhol Foundation for the Visual Arts and is also an artist who during the past fifteen years has developed a substantial and interesting body of work. And it isn't that Michael takes his art as a hobby, as he holds an MFA from Hunter College where he studied art theory with conceptual artist Robert Morris and executed his thesis under the advisement of Nari Ward. He can only be serious and deep about why he puts himself and his work out there, because much like Warhol, Michael avoids pigeonholing and the cages that keep people's talents underdeveloped and compartmentalized. Most recently, he also established Frances Saint Charles, a company focused on producing culturally relevant projects. Michael in the conference room at The Andy Warhol Foundation. Photo by James J. Williams III. I met Michael many years ago through his role at the Andy Warhol Foundation which he has had since 2005. Given Andy Warhol's desire to connect with people at every level and to expand his art as far as possible, licensing at this foundation isn't only a crucial pillar in carrying forward Warhol's legacy through hundreds of very well selected partners, but it is also a very significant source of revenue that helps fund the many grants given every year to non-profit organizations that support visual artists and arts programming around the country. Michael has spearheaded notable high-profile Warhol projects including collaborations with Dior, Comme des Garçons, Absolut, Supreme, and Perrier, and also conceived the acclaimed monograph of Warhol’s Polaroids published by TASCHEN in 2015. Flowers for Julian, 2016. Inkjet and oil paint on canvas. In his facet as an artist and for his latest series, Michael’s starting point is his own archive of more than 70,000 digital images collected through decades and kept organized in files in his computer. He chose the most compelling ones and those he kept going back to look at. The selected images are enlarged and printed on canvases. Michael then primes the surfaces and proceeds to hand-paint with oil lush and rich flower compositions evocative of Flemish style paintings of the 15th and 17th Centuries, using a pop-saturated color palette that looks at Warhol's own acid tones for inspiration. Flowers for Joaquin, 2016. Inkjet and oil paint on canvas. This new body of work entitled Flowers, to be shown for the first time to the public this week, began conceptually as an homage to Michael's late grandmother, whom he lived with until the age of four and who was the embodiment of a free spirit. She was what a grandmother should be to every grandchild: a woman who encouraged people to live one's life with plenty of fun, creativity and days off to explore beaches and museum shows. Her recent passing prompted Michael to look at the subject of flowers from several points of view: as memories of a cherished moment in time, as a celebration of life and as a reminder that small gestures can have lasting effects. The ongoing series starts with a group of eleven square-format paintings whose sizes range from 30" x 30" to 42" x 42" - each of which is considered by Michael as an "offering" to friends and family, some alive and some deceased. The intricate detail of the layers include the images and the painted flowers, which cause wonder, amusement and curiosity. In Flowers for Atticus, the base image shows a side close-up of an old man's eye which is opened with a speculum or some surgical tool. The eye socket has been covered with Michael's flowers, a powerful combination that includes brightly colored tulips, camellias, lilacs, peonies and grapes. The image has me staring while at the same time I'm a bit frightened and don't want to look any longer than necessary. Flowers for Alexis, 2016. Inkjet and oil paint on canvas. 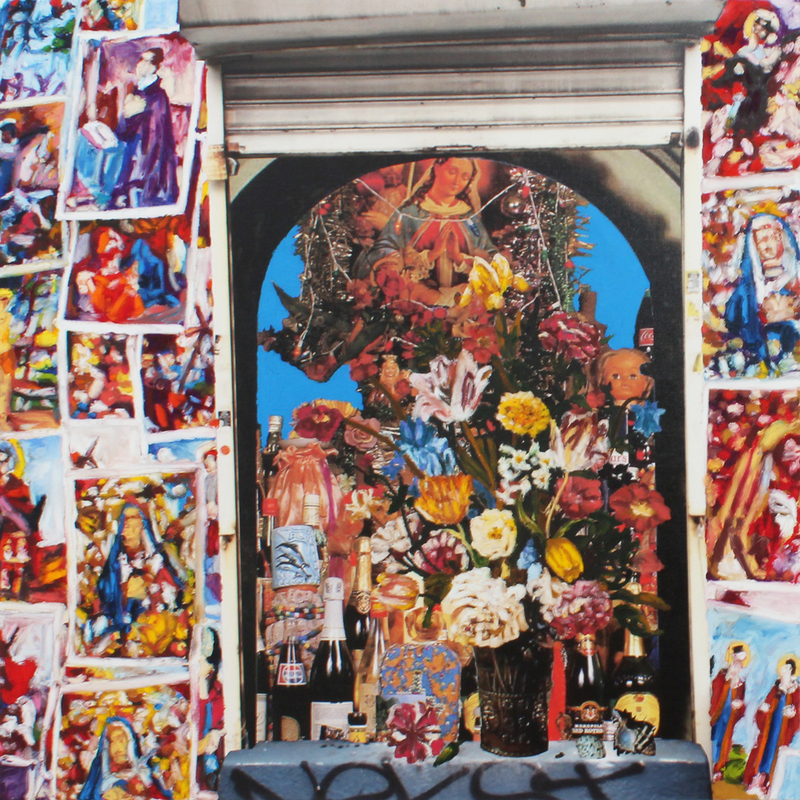 In Flowers for Joaquin, a friendly dog completely made out of flowers has been painted over the picture of a gritty New York City metal door, the type that's covered in graffiti tags and skateboarding stickers. The heartwarming and disarming edge comes from the combination of a background that's decidedly urban and from the fringes, with an abundant and colorful Dutch-Baroque style still life that includes bows and ribbons, roses, chrysanthemums and butterflies. The dog itself is a powerful tribute to cheap little mementos and kitschy objects that bring Michael back to his childhood and can help anchor anybody's memories. There are even more references to art history in Flowers for Alexis, which shows a reproduction of Boy with Basket Fruit by Caravaggio, with the boy carrying a large bouquet of flowers and a myriad of character-based colorful helium balloons, as if coming out of the prize section of a carnival or a fun fair. Flowers for Atticus, 2016. Inkjet and oil paint on canvas. The result of Michael's Flowers is a group of soulful paintings where the combination of intriguing imagery that oscillates between dark humor and the purity of childhood memories overlooks the superficiality of decorative nature and goes straight to the core of human emotions. Flowers for Danielle, 2016. Inkjet and oil paint on canvas.